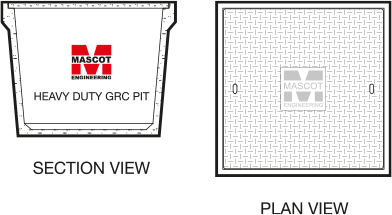 Mascot Engineering’s lightweight concrete covers are manufactured to sit flush into the rebate of our range of GRC Pits. Availablie without markings, or with Electricity and Communications all are finished with a non-slip checkerplate style finish. These covers are suitable for use in pedestrian trafficable areas only. Check your inbox for an activation email. Sometimes it can take up to an hour. If you haven’t received it, please make sure it hasn’t gone through to junk mail. Please tell us a little about yourself. We won’t share your details with anyone else.